Wernher von Braun was one of the most important rocket developers and champions of space exploration from the 1930s to the 1970s, and the son of a baron. Von Braun's enthusiasm for the possibilities of space travel was kindled early on by reading the fiction of Jules Verne and H. G. Wells, and the technical writings of Hermann Oberth. It was Oberth's 1923 classic Die Rakete zu den Planetenräumen (By Rocket to Space) that prompted the young von Braun to master the calculus and trigonometry he needed to understand the physics of rocketry. At age 17, von Braun became involved with the German rocket society, Verein für Raumschiffahrt (VfR), and in November 1932 signed a contract with the Reichswehr to conduct research leading to the development of rockets as military weapons. In this capacity, he worked for Captain (later, Major General) Walter Dornberger – an association that would last for over a decade. In the same year, under an Army grant, von Braun enrolled at the Friedrich-Wilhelm-Universität from which he graduated two years later with a Ph.D. in physics; his dissertation dealt with the theoretical and practical problems of liquid-propellant rocket engines. Some of von Braun's colleagues from the VfR days joined him in developing rockets for the German army. By 1935, he and his team, now 80 strong, were regularly firing liquid-fueled engines at Kummersdorf with great success. Following the move to Peenemünde, von Braun found himself in charge of the A-4/V-2 project. Less than a year after the first successful A-4 launch and following a British bombing raid on Peenemünde, mass production of the V-2 was switched to an underground factory in central Germany. Von Braun remained at Peenemünde to continue testing. In mid-March 1944, von Braun was arrested by the Gestapo and imprisoned in Stettin. The alleged crime was that he had declared greater interest in developing the V-2 for space travel rather than as a weapon. Also, since von Braun was a pilot who regularly flew his government-provided airplane, it was suggested that he was planning to escape to the Allies with V-2 secrets. Only through the personal intervention of Munitions and Armaments Minister Albert Speer was von Braun released. "Basic research is when I'm doing what I don't know what I'm doing." When, by the beginning of 1945, it became obvious to von Braun that Germany was on the verge of defeat, he began planning for the postwar era. Before the Allied capture of the V-2 rocket complex, von Braun engineered the surrender to the Americans of scores of his top rocket scientists, along with plans and test vehicles. As part of a military plan called Operation Paperclip, he and his rocket team were whisked away from defeated Germany and installed at Fort Bliss, Texas. There they worked on rockets for the US Army, launching them at White Sands Proving Ground. In 1950 von Braun's team moved to the Redstone Arsenal near Huntsville, Alabama, where it built the Army's Jupiter ballistic missile. In 1960, von Braun's rocket development center transferred from the Army to the newly established NASA and received a mandate to build the giant Saturn rockets. Von Braun was appointed director of the Marshall Space Flight Center and chief architect of the Saturn V. He also became one of the most prominent advocates of space exploration in the United States during the 1950s. In 1970, he was invited to move to Washington, D.C., to head NASA's strategic planning effort but less than two years later, feeling that the US government was no longer sufficiently committed to space exploration, he retired from the agency and joined Fairchild Industries of Germantown, Maryland. Like many of his fellow German rocket scientists and science-fiction writers of the time, von Braun believed that an orbiting space station was a crucial first step toward manned interplanetary travel. In the March 22, 1952 issue of Collier's magazine (see Collier's space program), von Braun and other scientists contributed articles describing and advocating construction of an American space station. Illustrated by space artist Chesley Bonestell and others, this issue publicized the wheel- or doughnut-shaped design (see von Braun space station) that became the most popular image of the space station. 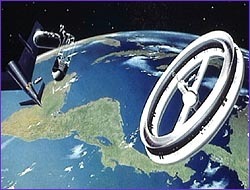 Later it was memorably depicted as Space Station V in Stanley Kubrick's film 2001: A Space Odyssey (1968). 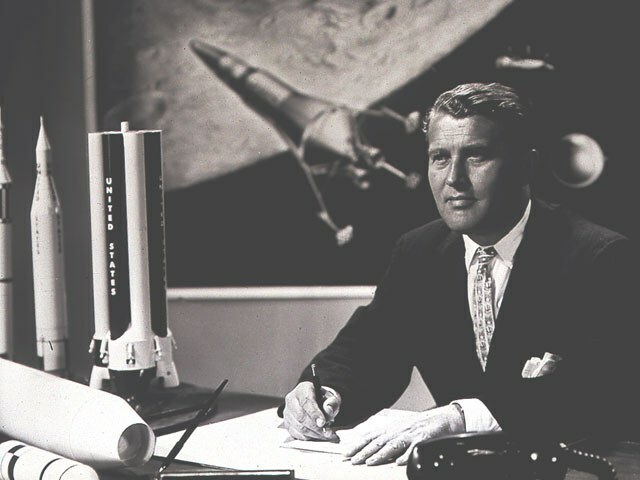 Soon after the publication of the Collier's space issue, von Braun appeared in a three part Disney television series, which he helped to produce, on the future of space travel. The shows – "Man in Space," "Man and the Moon" and "Mars and Beyond" – were enormously popular. The public enthusiasm sparked by the shows and the Collier's article, which ran 4 million copies, is considered a turning point in the American pursuit of space travel by some historians. "Von Braun (caused) a great shift in public opinion in terms of space flight," said Mike Wright, historian for NASA's Marshall Space Flight Center, where von Braun conducted much of his work. "(He moved) that view of peaceful space exploration – the idea of going to other planets – into the realm of a potential, of a reality," Wright said.